There’s just one version of the P16 TAC, but there’s also a P16. The P16 has an indicating side switch, but otherwise the P16 TAC seems to be a spec bump (higher output). These go for around $69.95. 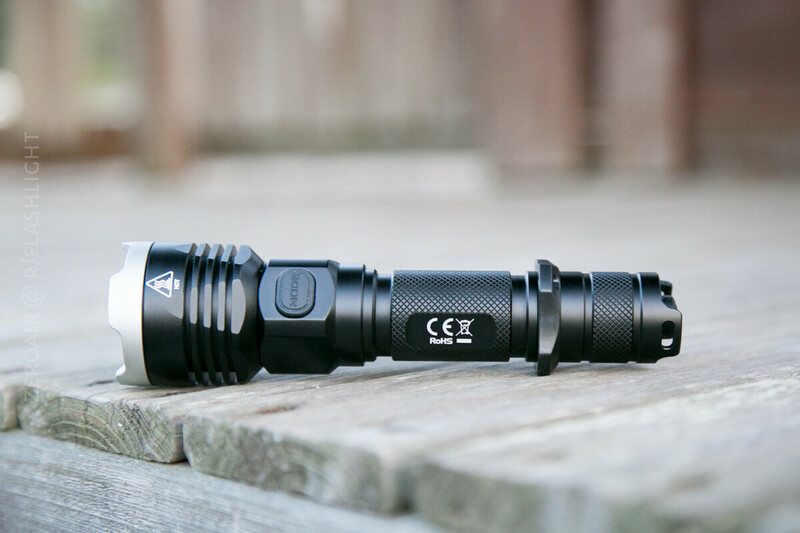 This is a solid, simple light, and the dual switches make a great combo. 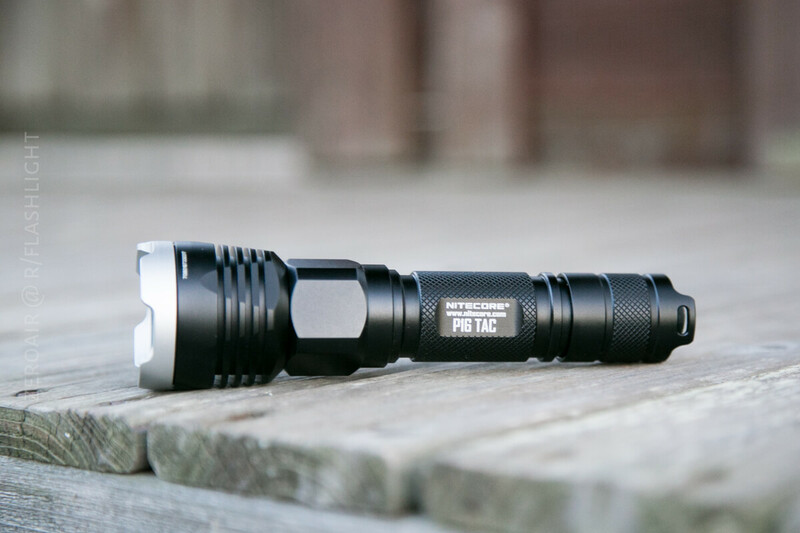 The light lacks a bit of “wow” factor for me, but is well built and does what it’s intended to do. The manual is good too. It contains about the same amount of info as the box, however. 😛 Here’s a .pfd link to the manual. 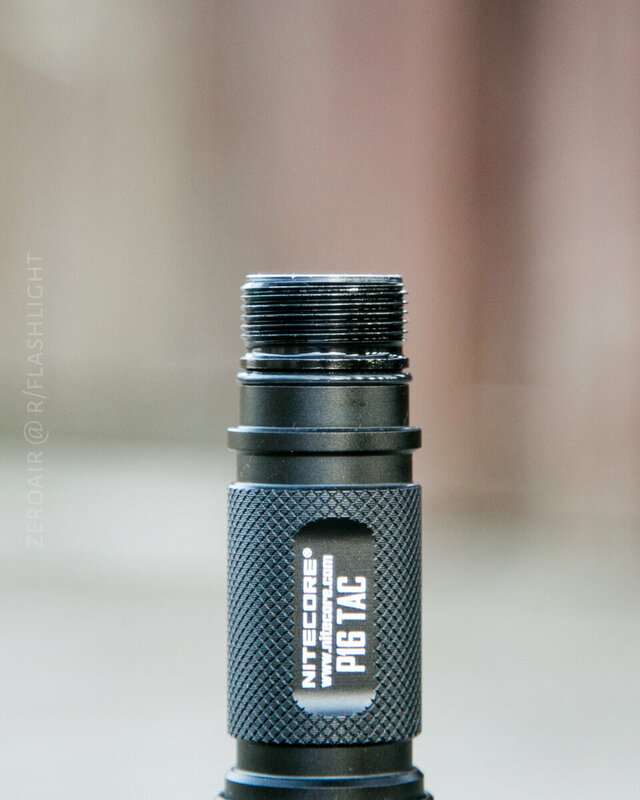 The P16 TAC has typical Nitecore build quality. In my experience, that’s great quality. The threads are anodized and well lubed. The o-rings are beefy. The anodizing is nice and thick. I haven’t disassembled the light all the way down to the driver, but the parts I can see are good. The bezel is crenelated, and on a tactical light these might sometimes be very sharp, but I don’t find that to be the case on this light. They’re fairly “soft”. Note also those large cooling fins. The threads are anodized and there’s plenty of lube. Those aren’t square cut, but they’re still good enough. I wasn’t able to separate the cell tube from the head of the light (or the bezel off the head for that matter) but here you can see spring on the tailcap. It’s a small spring but fairly stiff. 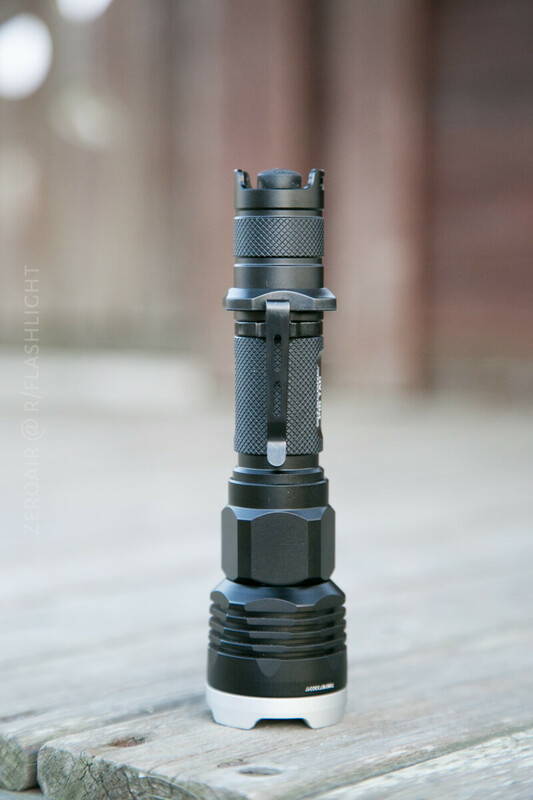 The driver side of the light, while it can barely be seen here, is just like a previous Nitecore I reviewed, the SRT7GT. It’s a bit of an odd design, with a button at the end of a spring, and around this button, a rubber gasket. This design precludes the use of flat top cells. 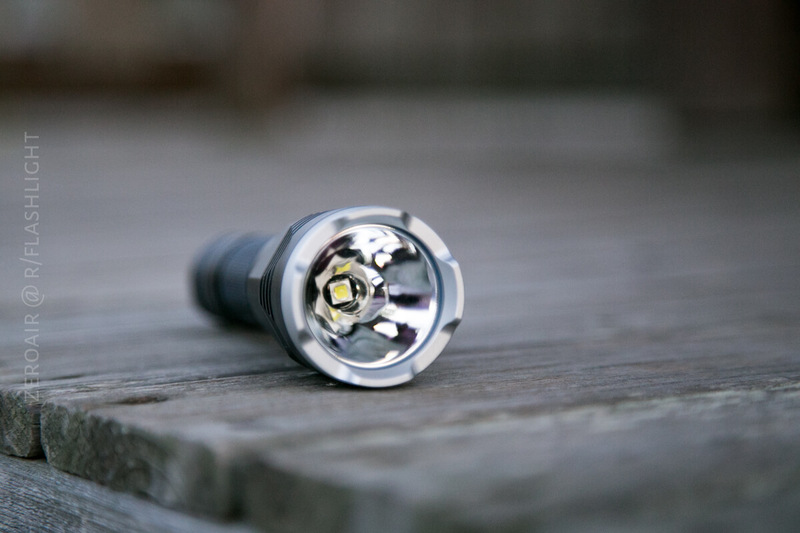 I tested the light with a Nitecore brand IMR 18650, which is a button top. You’ll have to use button tops in this light. Officially the light is 151mm long, 40mm at the head and 25.4mm at the tail. Without cell, the light weight 141g. This light is probably a little long for what it is. 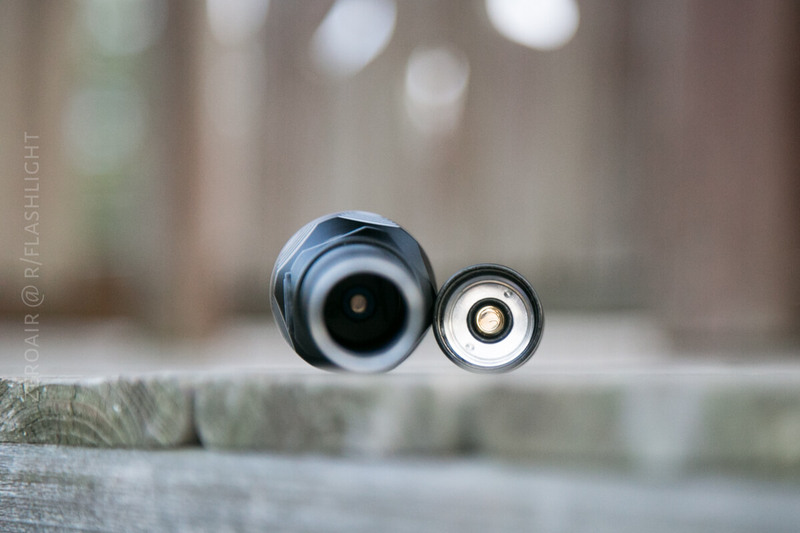 Below you can see it compared to the Klarus XT11GT, which has nearly the same throw rating, and also dual switches, and adds onboard charging too! There are a number of options here. First, the nylon pouch. It’s directional, with the tail of the light going in first. There’s a nice (plastic) d-ring on the back, and a double loop velcro belt loop. There is a pocket clip, which does not come installed. It’s reversible, for bezel up or down carry. There’s a tactical ring, which also has a cutout for the lanyard. 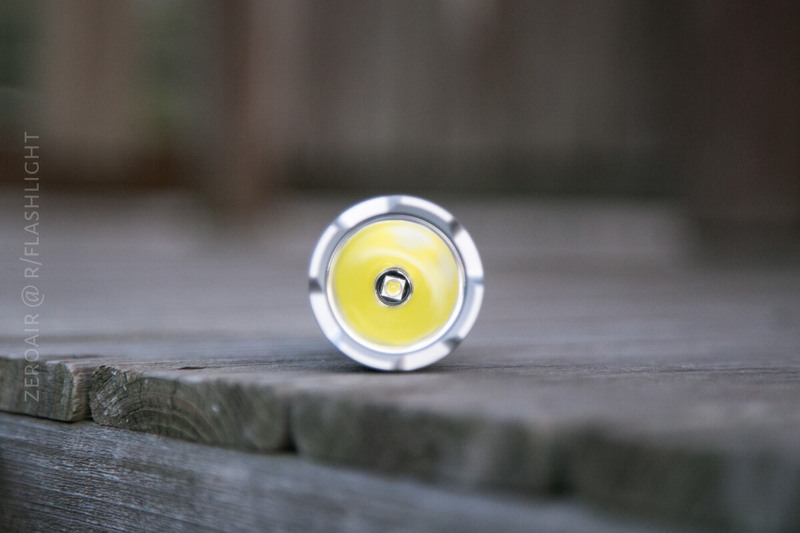 This tac ring spins relatively freely on the light, even when the parts are tightened down. 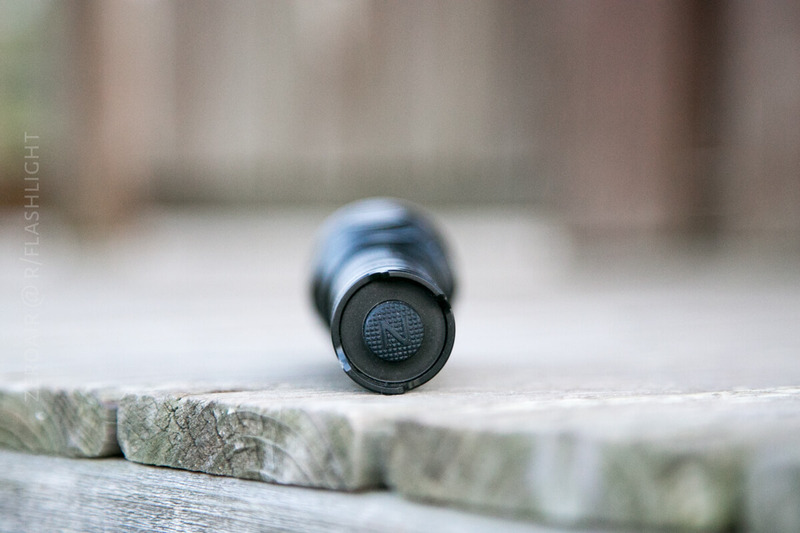 The pocket clip and the tac ring can be installed concurrently, but in this case the pocket clip must be in one of the grooves of the tactical ring. Since this ring floats, that’s not a problem. 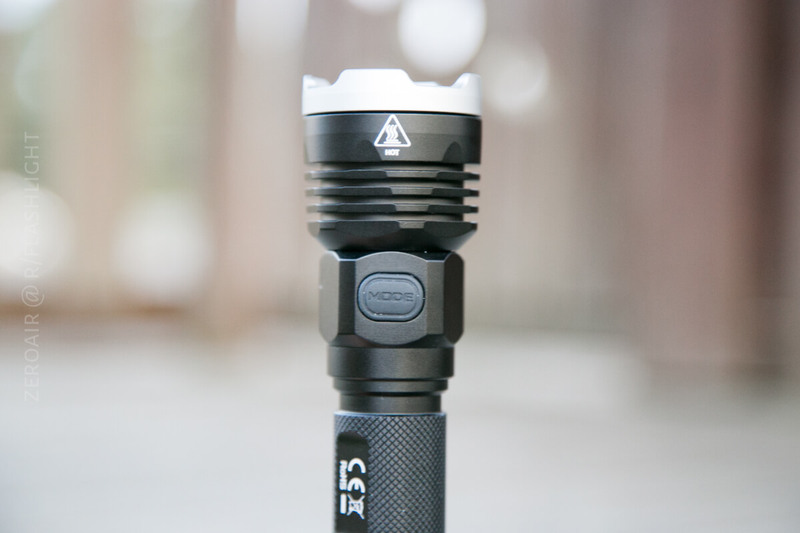 The P16 TAC is powered by a single 18650, or two 18350 cells. These must be button top cells, but length is not important. I used a Nitecore 3100mAh IMR 18650, and I didn’t do any testing with 2×18350 cells. Below is the runtime. I ran two tests on turbo. The blue test, I stopped at about 80 minutes, with a concern for cell voltage. It was ok, so the next test, I let the light go longer. There is no LVP on this light, and when I finally stopped the test, the cell was at 2.57V. So be aware of no LVP. 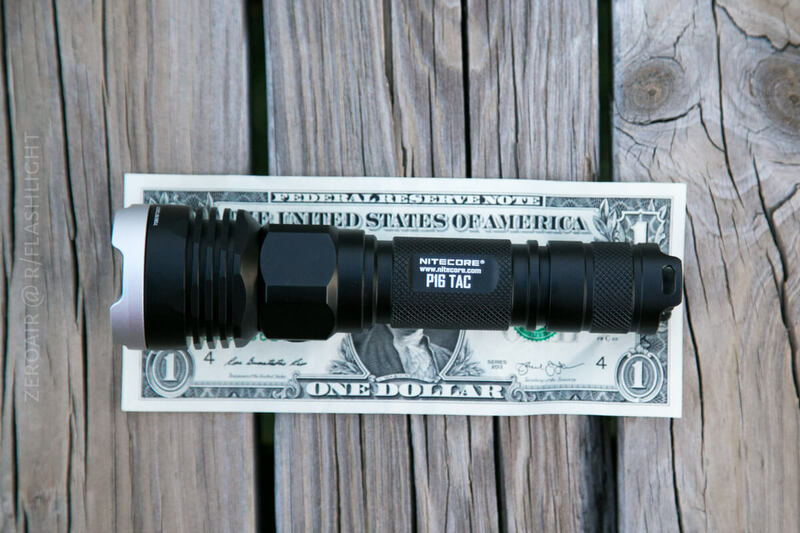 Not that one would really want LVP in a tactical light, right? Here’s a blow-up of the first 10 minutes. I’m going to try to do this more, because I think it provides as much useful information as the WHOLE runtime seen above. The light is only on 100% for a matter of seconds, but holds around 90% for 5 minutes. That is a timed stepdown at 5 minutes. There are two switches on this Nitecore. One mechanical forward clicky tail switch (the “Power switch”, and one side e-switch (the “Mode switch”). There’s a Cree XM-L2 U3 in this light. It sits at the base of a deep, smooth reflector. It’s a bit of a surprise that there isn’t a domeless emitter in here, since this light is meant to have a bit of throw. Of course everyone knows my love of the XP-L HI…. The beam does have a tight hotspot, but the spill is also well defined. It’s not normally very noticeable, but if one rotates the light, the bezel crenelations can be seen easily, in the beam profile. This seems to me to be a bit of a saturated market that this light slots into. I can see a lot of people buying it on name recognition. 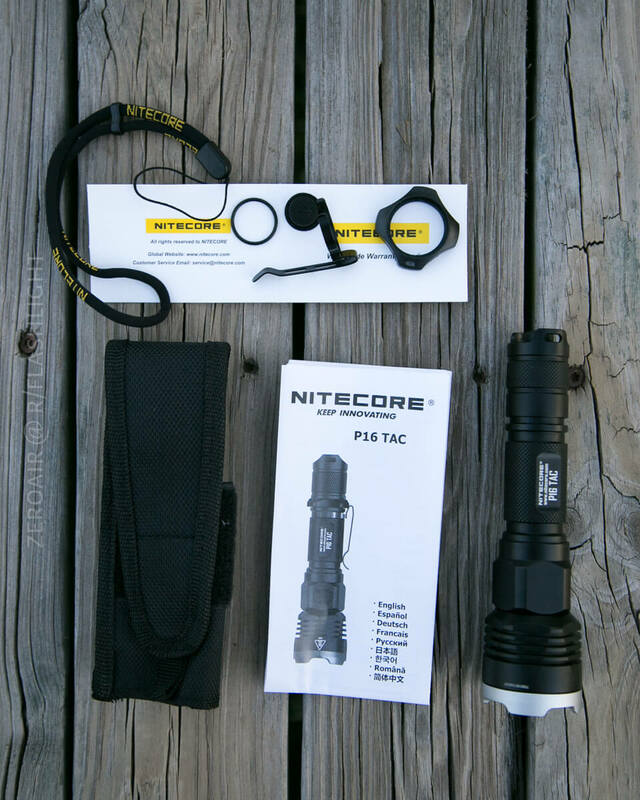 I’m satisfied with Nitecore’s quality. 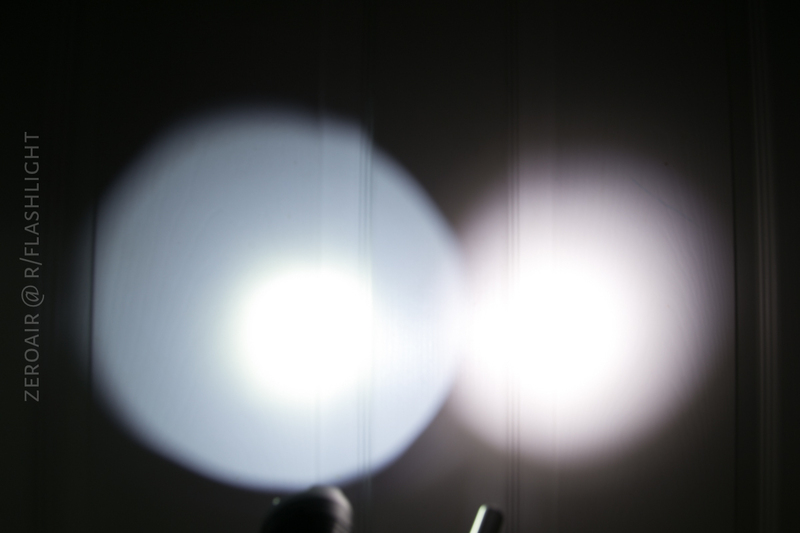 There are other lights that offer as much or more (like the light shown above, the Klarus XT11GT, or the XT12GT as well), but also cost more. I’ll have the Nitecore SC4 next, but right after, I have a monster of a review! 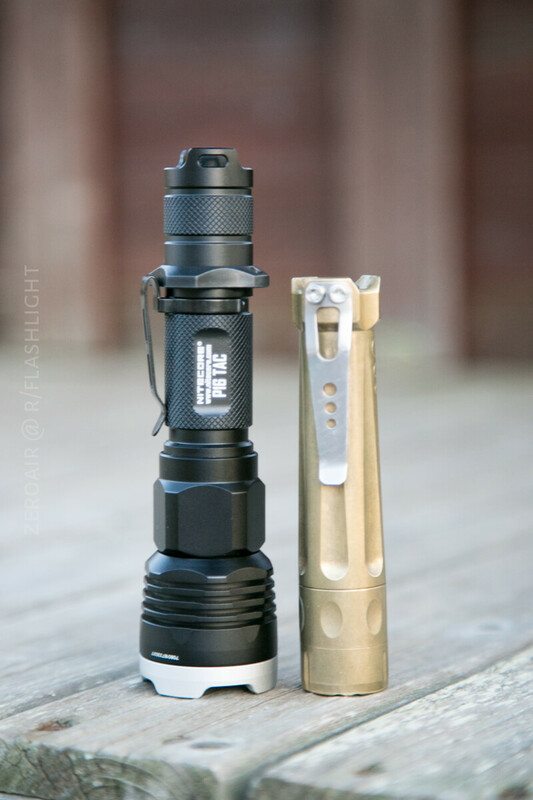 The Nitecore TM38, Tiny Monster!! This light was provided by NitecoreStore.com for review. I was not paid to write this review.